East Meredith, N.Y. – Waterwheels big and small will be featured at Free Family Saturday on July 28 at Hanford Mills Museum. Visitors can tour the historic water-powered mill and see how the 1926 Fitz overshot waterwheel is used to operate the historic sawmill, gristmill, and woodworking machines. 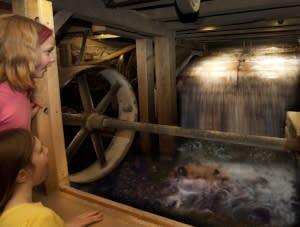 “Families with young children can come enjoy a guided tour of the historic water-powered mill. We’ll have model waterwheels out so visitors can experiment and play and get a hands-on lesson in water power,” says Liz Callahan, the Museum’s executive director. The Learning Lab at Hanford Mills also features blocks, gears, and books to engage young children. Visitors are welcome to picnic by the Mill Pond, and explore the Museum site on their own, which includes the John Hanford Farmhouse, an ice house, a blacksmith forge, and several barns. In the Feed Mill, visitors can watch an introductory video and view the new exhibit, “Today’s Schedule Did Not Go According to Plan,” about restoration and preservation efforts at the Museum. Hanford Mills is open from 10 am to 5 pm, the last tour of the day begins at 3:30 pm. On Free Family Saturdays, up to two adults will be admitted free of charge when accompanied by a child under 18. Students aged 13-18 will be admitted free of charge as well. Children 12 and under always receive free admission to Hanford Mills Museum including for special events, like the Antique Engine Jamboree on September 8 and the Woodsmen’s Festival on October 13. Museum members also receive free admission. The next Free Family Saturday will be held on September 1. Funding for Free Family Saturdays comes in part from a grant from Stewart’s Holiday Match. See the website for more information and directions, hanfordmills.org or call 607/278-5744. Hanford Mills Museum operates an authentic water- and steam-powered historic site, which includes a sawmill, gristmill and woodworking shop. The mission of Hanford Mills Museum is to inspire audiences of all ages to explore connections among energy, technology, natural resources and entrepreneurship in rural communities with a focus on sustainable choices. The Museum, which is listed on the National and New York State Registers of Historic Places, is open 10am-5pm, Wednesdays-Sundays, and holiday Mondays, through October 14.